A gold necklace comprised of a central section of diamonds, suspended pearls and polished ruby and emerald drops. The central section is attached to a clasp by red and green enamelled crescent-shaped ornaments and three flexible gold cords. Gold mounted cabochon rubies are inset on both sides of the clasp. 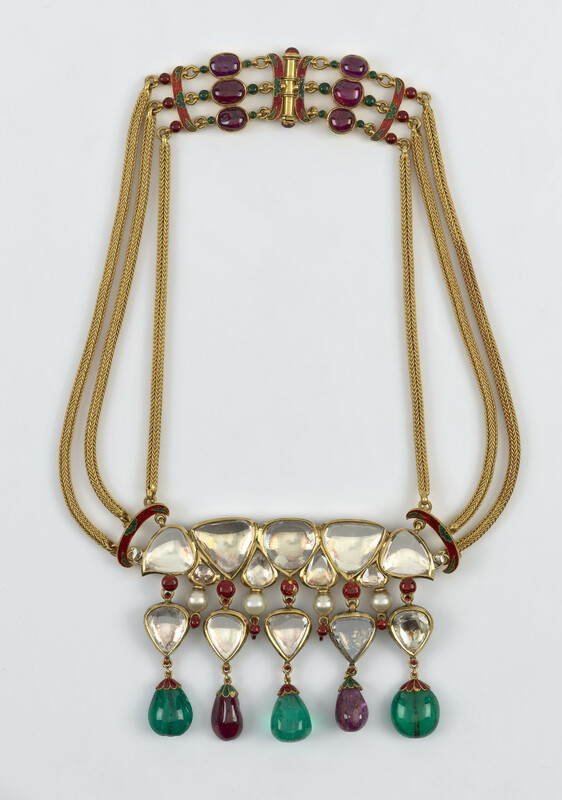 Components of this necklace were made by Phillips Brothers & Sons using gemstones from a necklace presented to the Queen Victoria by the Maharaja of Gwalior and a ring presented by the Maharaja of Mysore. The London-based jewellers mounted the foil-backed diamonds and rubies to preserve the original Indian style of setting known as kundan (pure gold). Kundan -setting involves skilfully working highly-refined strips of gold to secure gemstones to a metal framework through pressure rather than heat. This method of gem setting is unique to the Indian subcontinent. Phillips Brothers & Sons admired Indian enamelling and created jewelled objects using enamel inspired by Indian designs, the most notable example being an enamelled and gem-set gold stand for a Mughal crystal bowl now in the Victoria and Albert Museum's collection. The red and green enamelled ornaments on this necklace represent the jeweller's attempt to emulate Indian enamel patterning. The enamelled designs of red and green flowers on white ground on the back of the necklace is Indian and was preserved by Phillips when the necklace was reset.